For those that follow me, you know I get a bit off the beaten path. In the last few years, that has included more and more canoeing. With a few planned shots of cypress at night, I wanted a headlamp that would help me navigate and be seen, should I be in a higher traffic area.I have also always been a flashlight junkie, looking for brighter and brighter lights. 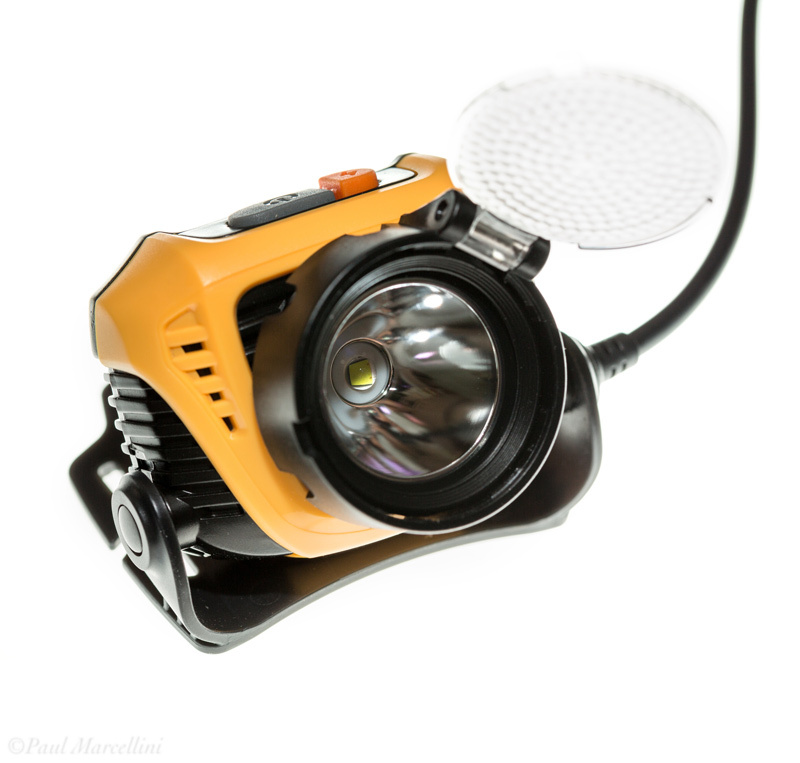 Well, with LED technology, this has advanced very quickly and allowed for more compact and powerful lights that actually have decent running times. I have had a few of the random run-of-mill headlamps from Princeton-Tec, Black Diamond, etc. They are all basically the same. Plastic housings and around $40 and 40 lumens or so. Great for camp and hiking but when I am paddling I want much more illumination than that. Since I am using both hands to paddle, I could not use a handheld flashlight so I went looking for a more powerful headlamp. Enter the HP30. 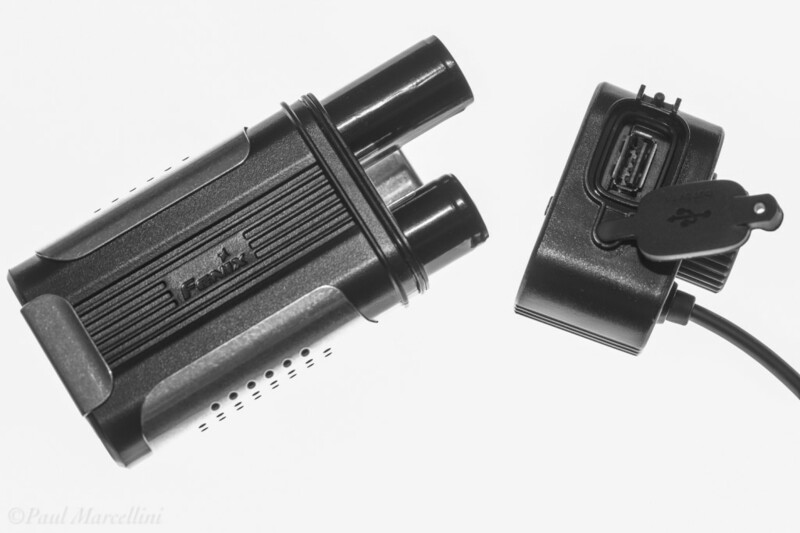 I was immediately impressed with the specs, 500 lumens on high and nearly 4 hours of runtime and an aluminum body. Also with 4 main brightness settings (4, 65, 200, 500 lumens, and turbo 900 lumens) it isn’t just a one trick pony. The other detail I really liked it that the reflector makes it more of a spotlight with a flip-up diffuser for when you want it more like a flood light. For paddling, this is great because I want more throw to my light, to see where I am going, but then can switch to a dimmer setting and put on the diffuser at my destination when I want to rummage through my gear and canoe. Also, if I am light-painting my subject at night, it will be nice to have both flood and spot in one light to try different effects. The lamp with diffuser flipped up. The grey button turns it on and off and cycles through the brightness levels. Orange is momentary turbo mode. I took the light out to the Everglades the other night to try it out and the high really is powerful. I have stronger handheld lights, but being used to the wimpier headlamps, the 500 lumens was really impressive and lit up everything I needed across the pond. The downside of this power is additional weight from increased battery size. Fortunately, the battery pack is on a long cord that can reach your pants to clip on a belt loop. I actually dropped it in my shirt pocket, which is what will usually be available since I wear hiking shirts a lot. It was convenient enough and not an annoyance. One thing I really liked is the battery pack is not a self-contained unit that needs to be charged, but houses 2 18650 Lithium batteries. I already use these a lot and have rechargeable versions. This is great because I can have back-ups ready to go and just swap them out as needed. The other huge bonus I didn’t notice until I got the light is that the battery pack has a USB outlet to charge other accessories in an emergency. The battery pack opened to show the removable 18650 batteries and the USB outlet. All in all, I am really excited to get out with this light. The other option was a Light and Motion headlamp at several hundred dollars. For under $90 the HP30 seemed like a bargain, but after playing around with it, I definitely feel this is a great bang for your buck. It is exactly what I was looking for and I can’t wait to try it out this summer on some of my planned outings and images. Hey folks, wow, it has been a long time since I put up a blog post. 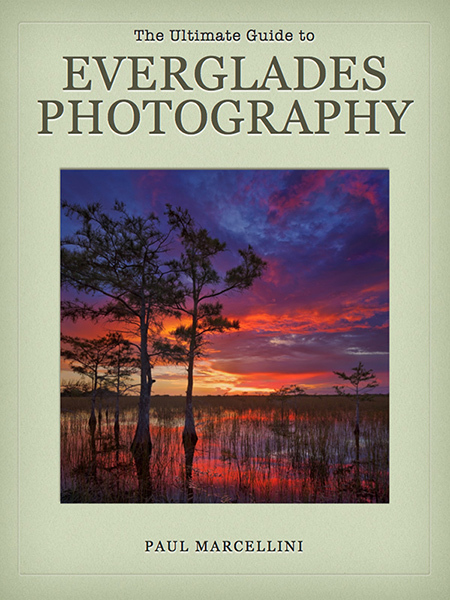 But, I am excited to release my first E-book, The Ultimate Guide to Everglades Photography. It is over 40 pages and offers insight into seasons, locations, landscapes, and wildlife. After a brief introduction to the Everglades, I get into the meat of it. Chapter 1 is the bulk of the book and gives details on various shooting locations throughout the national park. I dived the park into 3 sections, North, East, and South. The South Section has mileage given for locations and has the largest amount of area to cover. 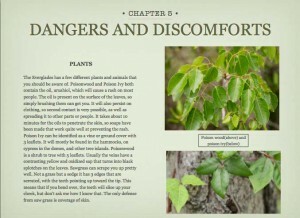 Chapter 2 covers shooting from water craft, Chapter 3 is camping and lodging locations, Chapter 4 is Clothing and Wet Hiking, and Chapter 5 is Dangers and Discomforts. At the end, is a quick reference with what I think are the best bets if you are short on time. You can purchase it here: Everglades E-book, and any purchase in September from my website is eligible for a $100 gift card. Thanks for looking and feel free to ask any questions! 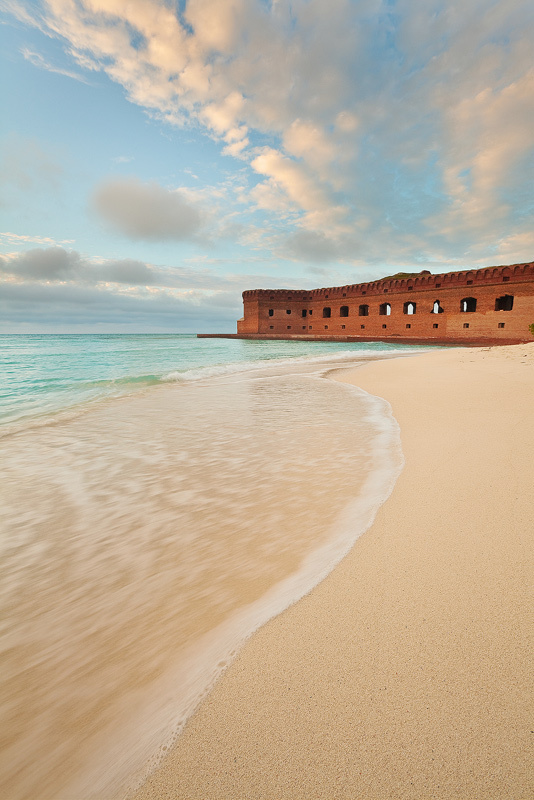 Dry Tortugas National Park is composed of 7 islands approximately 70 miles west of Key West. 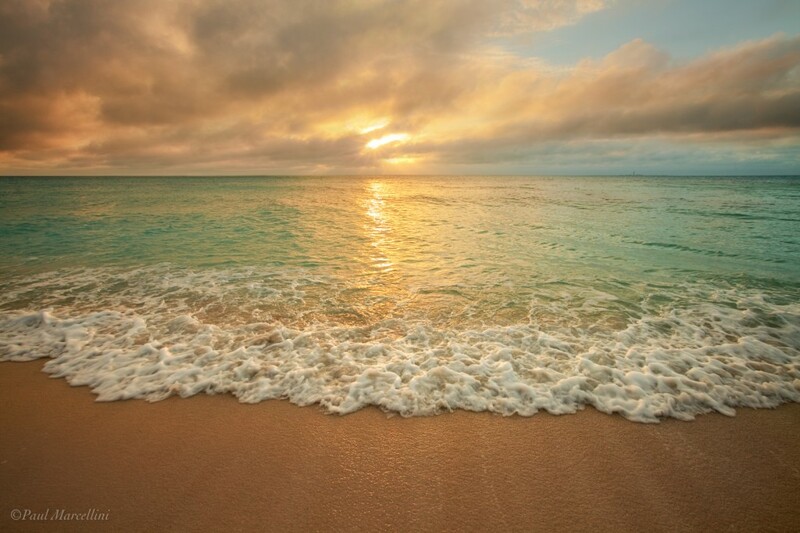 It also contains and protects about 101 square miles of marine habitat. 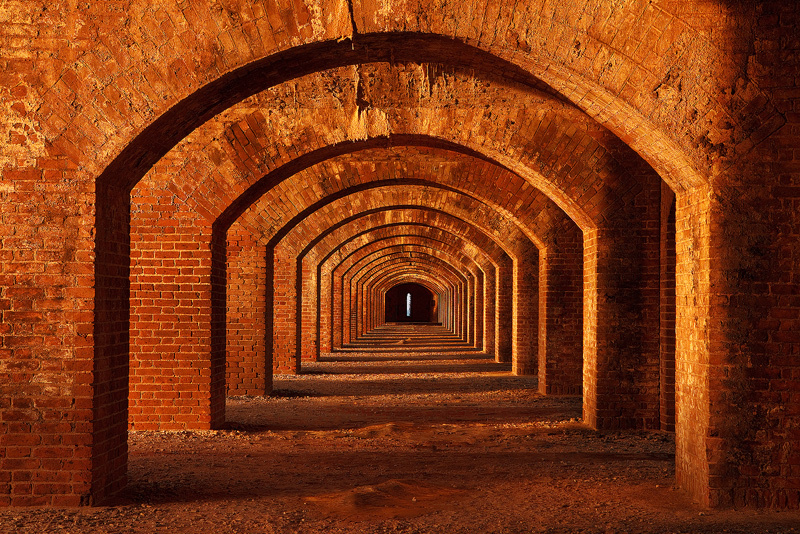 The most notable landmark of Dry Tortugas, however, is Fort Jefferson. It was thought a good idea to have the fort to help protect the straits connecting the Gulf of Mexico and the Atlantic Ocean. Construction began in 1847 and continued on through the Civil War, but was never fully finished. It served as a prison during the Civil War and its most famous inhabitant was Samuel Mudd, an American physician who was convicted and imprisoned for aiding and conspiring with John Wilkes Booth in the 1865 assassination of U.S. President Abraham Lincoln. I had been wanting to get to the Tortugas for years and finally planned a trip this past December. I timed it for the full moon, so I could try some night photography. I booked a two night camping trip and got all my gear ready. The trip started with 25 mph winds and made for a rough boat ride. I took the Yankee Freedom over, from Key West. I paid to have a kayak ferried with me, which never was launched do to wind. It also clouded over and I spent 2 days waiting for the wind to subside and the sun to come out. Snorkeling is supposed to be great down there, but with all the wind, visibility was pitiful. Just at sunset on the second day, the clouds began to break and I made sure to take advantage of it. The clouds also stayed sparse enough for me to get something including the moon, or at least the light from it. I went to sleep a little less nervous about a failed trip and awoke for sunrise. It didn’t amount to much but I knew what I wanted to do with the warm early light. 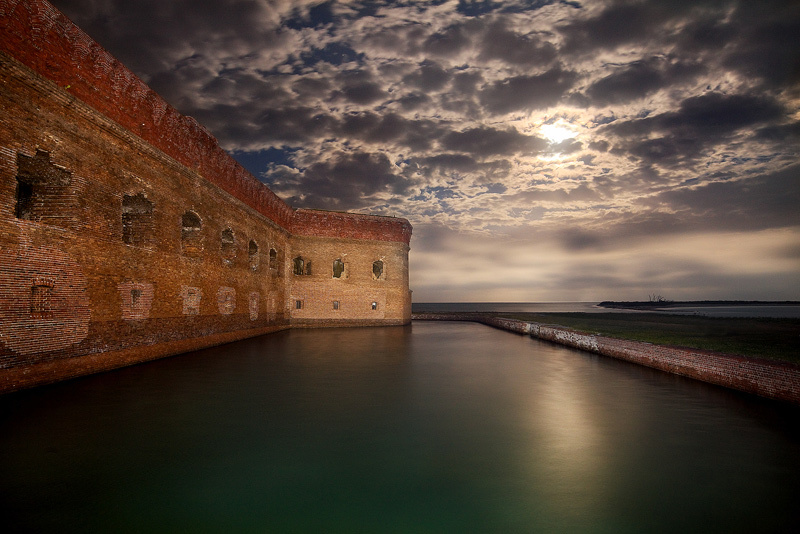 Although this image is iconic of Ft. Jefferson, I felt this light was pretty rare to capture. 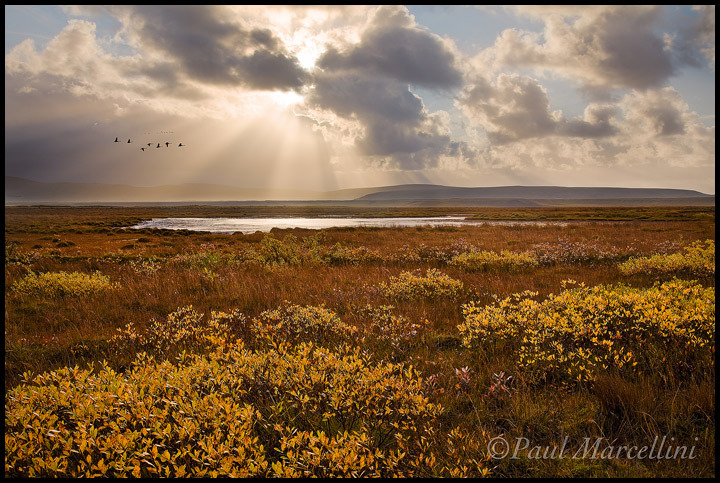 Most photographers are day-trippers and are never on the island when the light is this good. I camped for 2 nights and finally got this on the third day. Lucky me! At the end of September I was extremely fortunate to go to Iceland. I was extremely excited for the possibility of seeing Aurora Borealis, something that had been on my bucket list. It was a relatively quick flight for somewhere that seemed so exotic and detached. Just 5.5hrs from JFK airport. We landed at sunrise and made the trek east, after getting the rental vehicles and some food. It was quite cloudy and eventually the rains came, and stayed for several days. We had breaks where it was only windy, but it made for photographing anything a little more difficult. For a Florida boy, 40 degree weather, rain, and 40 mph winds don’t make for the most favorable conditions. So, we searched for things we could use the conditions with. Things that didn’t move. 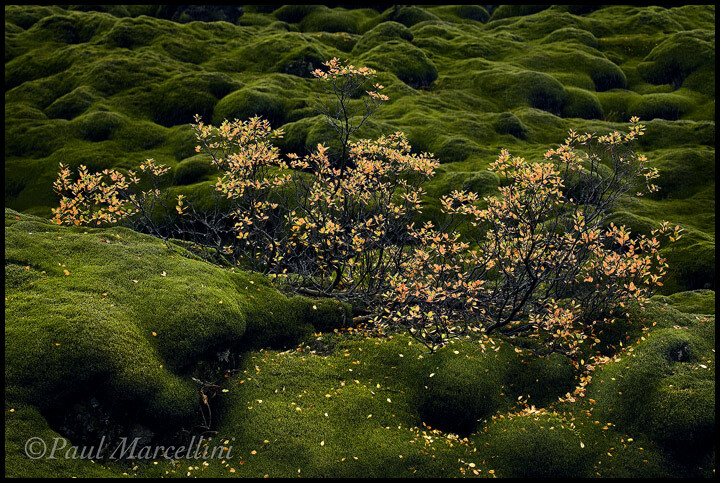 We found a big mossy area, which I was to learn is the old lava fields from Laki, one of the largest volcano eruptions in Iceland, happening over 7 months in 1783 and 84 and killing 25% of the population. Moss doesn’t move much, but I was determined to get some shots of the small bushes dotting the landscape in full fall colors. This took a lot of patience but I got several images over the next couple days that I really liked. 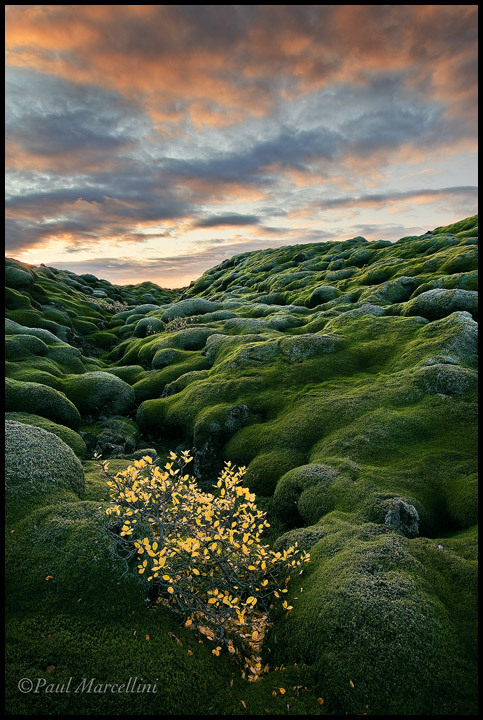 The boulders of lava went on for miles, covered in 6 inches or so of moss. It made for treacherous foot travel and I took a fun little tumble. Luckily, it is like landing on a tempurpedic bed! We encountered this area west of Vik on the way to Klauster. Another amazing area is Jokulsarlon. 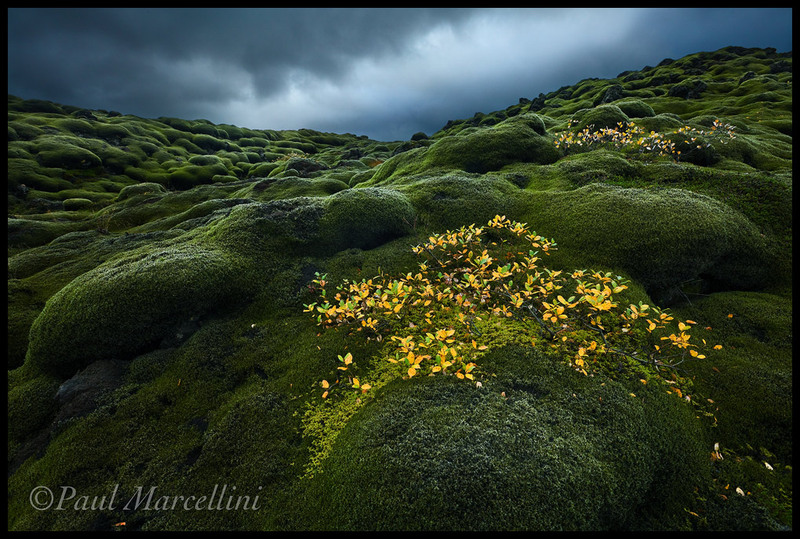 There is nothing like it and it is oft photographed by travelers to Iceland. Icebergs calve from the Breiðamerkurjökull glacier and float out to sea, where some are washed back onto the black sand beach. This makes for a dramatic contrast and a scene unlike anything else. 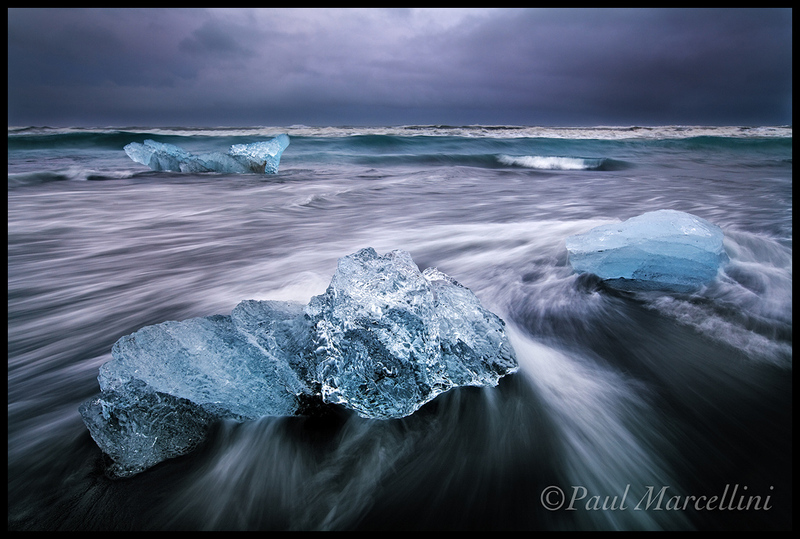 This was also a tough shoot because the icebergs move. 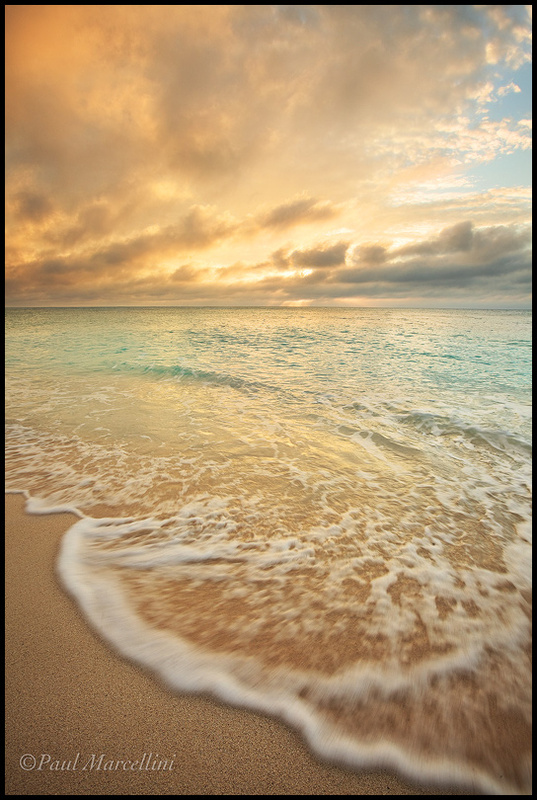 With each wave you either have to dodge them coming back in, or chase them back out, always recomposing your shot. 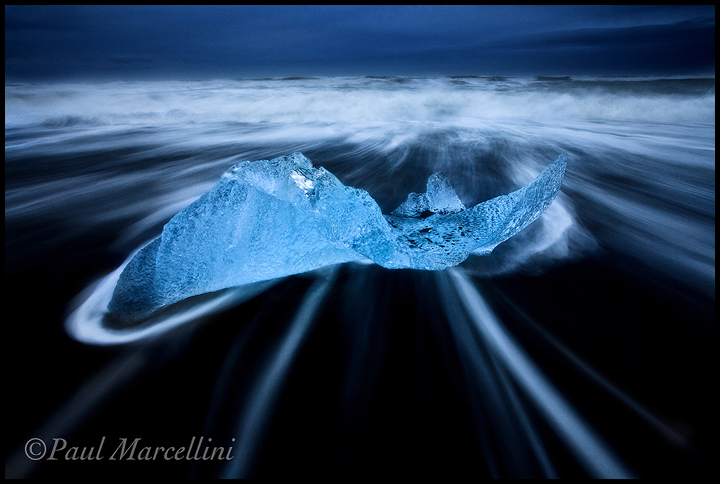 In the second image, my iceberg actually broke in half and floated away just 3 waves after the image I got. After 2 shooting sessions at Jokulsarlon, we made our way back west to trek into the highlands. Along the way we stopped at several waterfalls along the road(no shortage of them) and I took this image at one we nicknames Paul’s Falls because I had wanted to check it out for several days. I loved the recessed nature of it and how it had carved its way back into the rock. Somewhere along the road, we also got a touch of sunshine and I was sure to capitalize on it. Whooper Swans were the only native wildlife we saw(lots of sheep) and I timed this image as a flock flew through the image. Once into the highlands, we encountered a scene that seemed unreal. 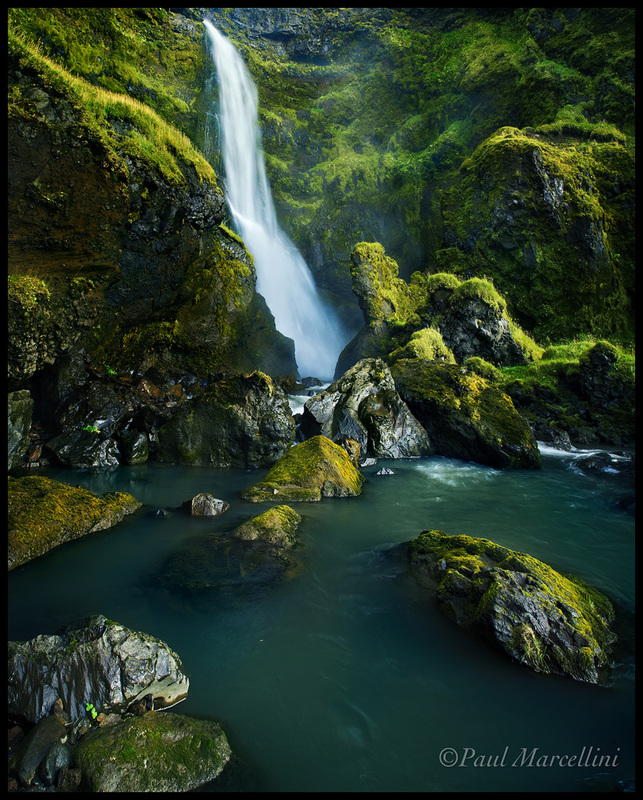 A nondescript canyon from afar, nestled among all the lifeless volcanic rock harbored at least 40 waterfalls, all leaking from the porous rock. 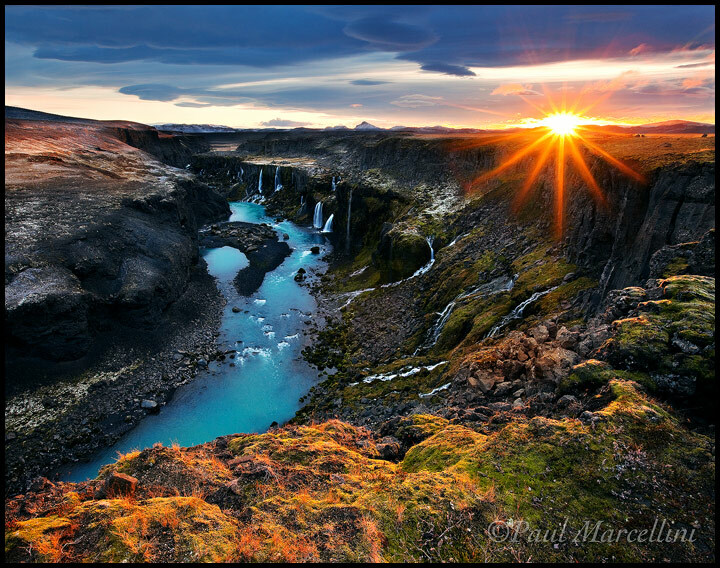 At the bottom was an amazingly blue river and on the third shoot at this location, a freezing sunrise, we got some sun! 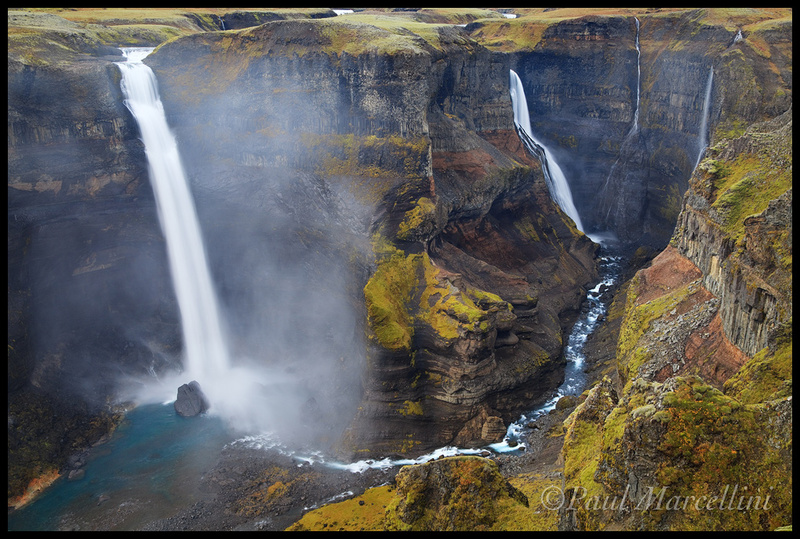 The last image was taken at Haifoss, meaning High Falls. 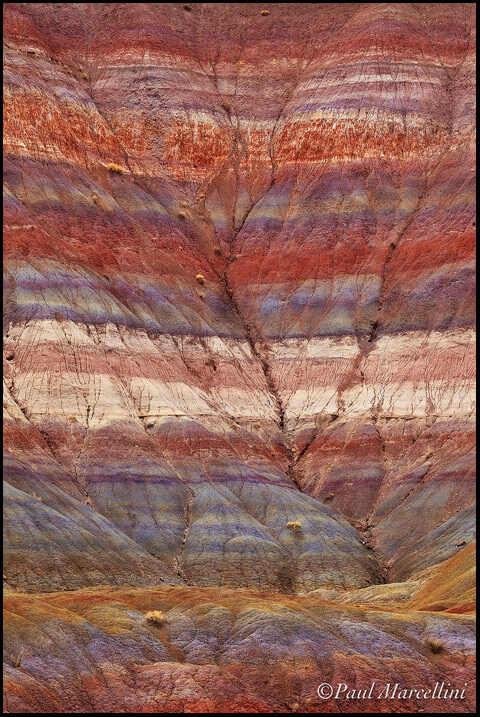 It didn’t have that many compositional opportunities, but at 400 feet tall, and the accompanying canyon, still a great view. Seems a bit of a contradiction but a telephoto can be a very effective lens for compelling landscape images. I started out shooting landscapes with the ultra-wide angle, which can be utilized to create depth in an image through an in-your-face foreground pulling the viewer in. Long lenses of maybe 200mm plus can be great for isolation or compression of elements to show repeating lines and patterns. I have been slowly adding images when they present themselves, but on my recent trip to the Pacific Northwest, I got 2 I was happy with and figured I would dig up some of the others. 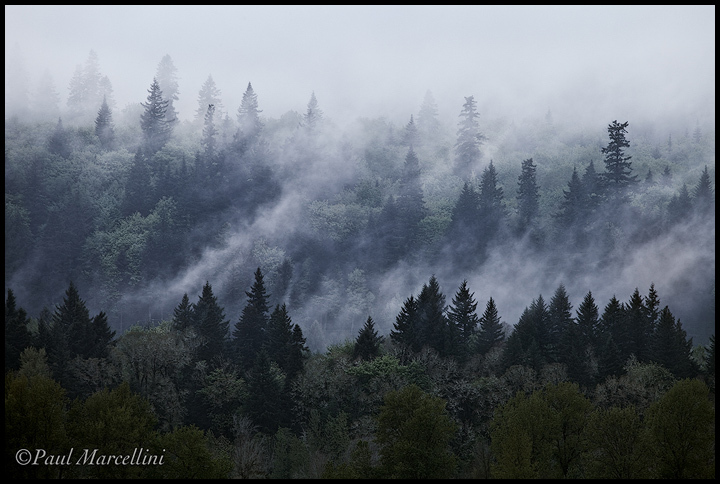 At, 400mm I was able to isolate the layers of trees and the fog that separated them. 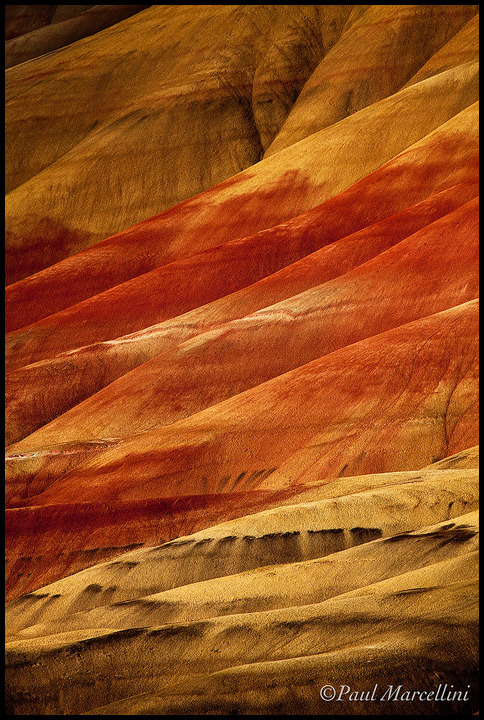 I was actually hoping to get an image like this from the Painted Hills before I even got there. I was happy the light cooperated, softly highlighting the center of the image so it was bordered in both color tone and luminosity. 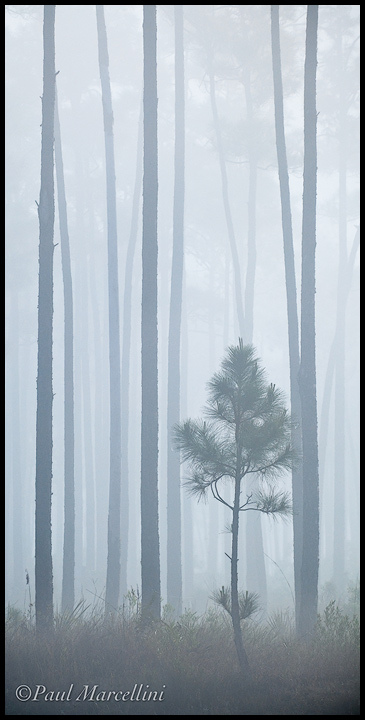 A young slash pine among larger trees. The 400mm allowed me to isolate this tree and compress the depth of the background trees, giving the appearance of a denser forest. Long lenses also can elp when the light is not ideal. Here, in tough light, I shot this scene in the shadowed side of the hill.